1) If you like Passion Pit, or were ever in the camp of people that wanted to see less of Ra Ra Riot and more from Discovery, you will like this song. * If someone told me to close my eyes and then told me this was by Passion Pit, I’d believe them. *Note: I don’t feel that way, but I know some people do. 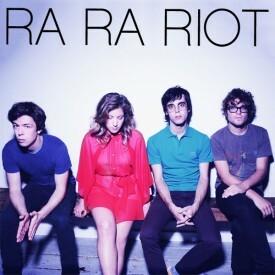 2) I really like Ra Ra Riot. I thought their last album was underrated and The Rhumb Line is great. Who doesn’t love a good (see: great) Kate Bush cover? 3) If this song had come out a few months ago, it would be my song of the summer. I would blast it in my car, with the windows down, yelling the lyrics, with the sun beating down on my face. Instead, I’m doing all of those things with the windows up. 4) It’s just damn catchy.